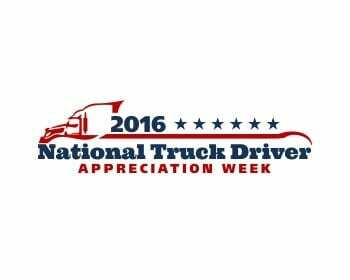 Today ends the one week every year when professional drivers in the trucking industry get the recognition they deserve. When many of us think about truck drivers, we think about the trucks. The semi trailers that we can’t see around, the slow moving, heavy, loud machines that seem more of a nuisance than anything else during our everyday commutes. If we take a minute, we can step back and look at what makes our country roll along smoothly every day, and that is the man (or woman) in the machine, the truck driver. The driver is the person who checks and double checks their flatbed loads in the sleet, snow, rain and heat to be sure that nothing will roll off or fly backward…you know you think about it every time you follow behind a load of steel coils. The driver is the person who makes sure that the essentials make it to your local grocery store, the reason that you have milk, meat, bread, baby formula, clothes. Truck drivers are more than just their job though, aren’t you? These people are parents, sons and daughters, grandparents, friends and neighbors. They have families at home who want them safe and respected. They are folks who try to do their best and make the day good. Truck drivers are more than that. Truck drivers have founded organizations to be on the lookout for missing and abducted children. They have organized to stop the epidemic of human trafficking. There are charities headed by truckers dedicated to funding cancer research, buying toys for poor children at Christmastime, supporting our troops and veterans, and even for protecting animals. Truck drivers are a group of hard working men and women who deserve our respect and appreciation every day, not just once a year. Here at HG Logistics LLC, a freight broker based in Cincinnati, Ohio, we know that without the professional truck drivers who work with us, we would not have just celebrated ten years in the industry. Truck drivers keep us rolling, they keep America rolling, and we not only appreciate them, but honor them. HG Logistics would like to thank the men and women who spend time away from home to make our lives easier. We love our truckers!